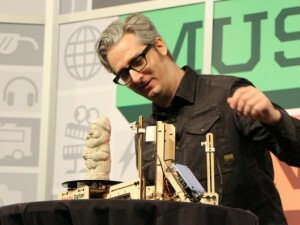 The Maker Movement is a technological and creative learning revolution underway around the globe. It inspired a vast world of Maker Education which challenges and enriches the education we know. New tools and technology, such as 3D printing, robotics, microprocessors, wearable computing, e-textiles, “smart” materials, and programming languages are being invented at an unprecedented pace. The Maker Movement creates affordable or even free versions of these inventions, while sharing tools and ideas online to create a vibrant, collaborative community of global problem-solvers. It is about making! Which means that problems are always real life and learning occurs natural. We are smarter that me. Sharing is key in the culture of the maker movement, as it is a child of the open source movement. This means learning faster and making more interesting things. Its experimental. Which means its all about trying and doing things that are personally meaningful, not the highest grades. Iterative design marks the proces which makes learning creative, risk free, and inexpensive. This way students learn through discovery in a non-lineair design proces rather than by repeating recipes. Aesthetics matter. Art and imagination are as important as technology in maker ed. We are moved by what is attractive. Mentoring, not teaching, is what makes Maker Ed universally applicable. All ages and skill-levels can work together. It is a very personal learning proces. To make something you have to make it, no one else can. Technology is more than a tool to use for something else, it is a door to discovery of problems and solutions never imagined before. The technology itself is exciting and working with it can be inherently gratifying. Ownership. Students own their learning proces by making, and they own what they made in a deep sense. Both in terms of understanding and personal meaning the making proces makes sense. In cooperation with De Waag and De Balie, and several experts, The Learning Lab developed a 4-day professional development course for teachers about maker education. Teachers get acquainted with the newest maker technologies—like digital fabrication, 3D printing, electronics, and programming. But most of all, they get to experience being a learner again. They get to be inspired, and to make what they always wanted to make. The format of this course will be transferred to other maker spaces and teachers in The Netherlands. Today, kids are growing up in an entirely new society—a society in which technology is becoming more important every day. Yet, within our educational system, we still prepare children to function in an antiquated society. We need citizens with skills for the 21st century: literacy, ICT literacy, creativity, teamwork, problem solving, and informed citizenship. These skills enable young people to play an active role in society, thereby improving their living environment and social opportunities. Making has gained new meaning in today’s society. Through the rise of the Internet, new making principles have been established. These principles are based on openness, transparency, and social connectedness. New professions arise on the boundary between virtual and physical reality. Enter, the crafts of the new century and the next phase of the digital revolution. With the advent of digital fabrication, physical products can now be created from digital files. Of course, human beings also want to give meaning to, and personalize their own products. When people are able to actively shape their environment, awareness of their actions increases. Thus, ownership and responsibility for the environment and life are likely to increase as well. “What I hear, I forget. What I see, I remember. What I do, I understand.” With this statement, Confucius illustrated an important principle 2,500 years ago: we understand the world better if we actively participate in it. In creating, we meet the world. We gain new experiences through creation, and learn about what works (and what does not). Making, therefore, leads to knowledge, insights, and opportunities. Many teachers are reluctant to use technology in their classroom. They are not familiar with digital fabrication, programming, and physical computing. They might also not know about the possibilities these new technologies can offer to enrich lessons. The central elements in this maker education course are: teachers, creativity, do-it-yourself, and enthusiasm for making, creating, and inquisitiveness. To inspire teachers while helping them develop 21st century skills, and challenging them to better prepare their students for the modern world, Waag Society, De Balie, and The Learning Lab are organizing this 4-day camp. Aan het begin van de herfstvakantie 2015 konden 40 leerkrachten en docenten (in tweetallen per school) vier dagen lang aan de slag in het Fablab in Amsterdam. Maakonderwijs is leren (door te) maken. Het is een creatieve manier om kinderen te helpen uitvinder te worden. Maakonderwijs stimuleert hoofd, handen en hart. In de afgelopen jaren zijn allerlei moderne technologieën goedkoop en makkelijker beschikbaar geworden. Denk daarbij aan 3D-printers en elektronica, waarmee kinderen, zowel jongens als meisjes, op een laagdrempelige manier kunnen ontwerpen én maken. De leerlingen van vandaag, en daarmee de werknemers en burgers van morgen, kunnen deze gereedschappen gebruiken om hun creativiteit te ontplooien. Door de verbinding tussen creativiteit en technologie kunnen kinderen zich beter ontwikkelen: kennis wordt meteen toegepast en ingezet voor het maken van dingen die ze leuk vinden. Aanmelden kan via het inschrijfformulier op: waag.org/tmc. 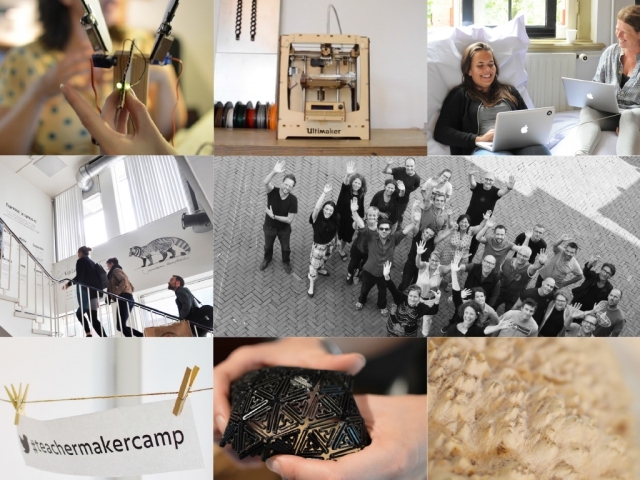 Je kan deelname aan het Teacher Maker Camp tot 1 mei 2015 aanvragen bij de Lerarenbeurs. Hier kan je maximaal 2.000 euro aanvragen voor professionalisering. Informatie over de regeling vind je via deze link:waag.org/lerarenbeurs. 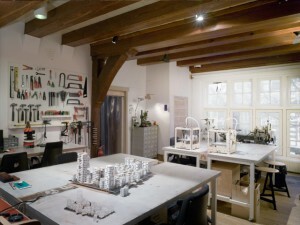 The Learning Lab, De Balie en Waag Society zijn initiatiefnemer en organisator van het Teacher Maker Camp. Deze editie wordt mede mogelijk gemaakt door het Stimuleringsfonds Creatieve Industrie.